Created distinctive digital experience in a landing page for the SA Museum’s Yidaki exhibition. As one of the most important exhibitions of the year, Yidaki required a strong and visually distinctive online presence that was mobile accessible and informative. The Digital Embassy were approached to create this experience within a deadline of only 2.5 weeks. 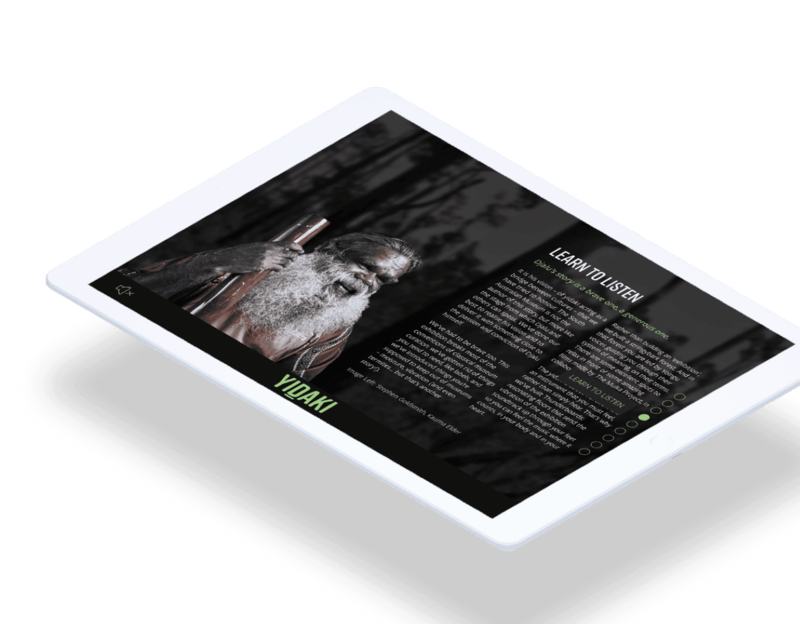 Having had experience working on other indigenous Australian projects such as the ILC and the Healing Foundation our digital agency was well positioned for the task. In order to capture the interest of potential exhibition visitors, our aim was to design a sensory rich online experience in the form a mobile accessible website landing page. The landing page would serve as the preliminary source of exhibition information for these visitors, and help facilitate ticket purchases. 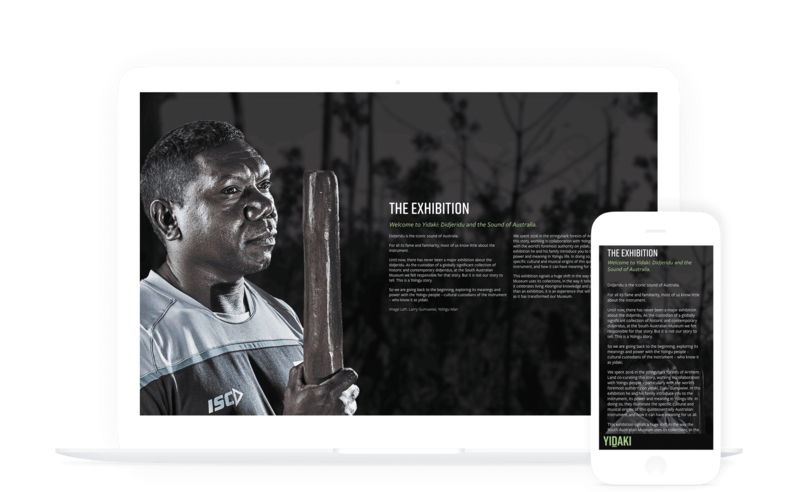 The website landing page framework was developed with the intention to be re-used for marketing future SAM exhibitions and would sit externally, independent from the South Australian Museum primary website. The team at The Digital Embassy began the task by designing wireframes and development architecture that contained a range of common modular elements that could be easily moved and repurposed. Not only did this approach enable rapid development for the website landing page to meet the short deadline of 2.5 weeks, it provided the South Australian Museum with a reusable design framework for future exhibitions. 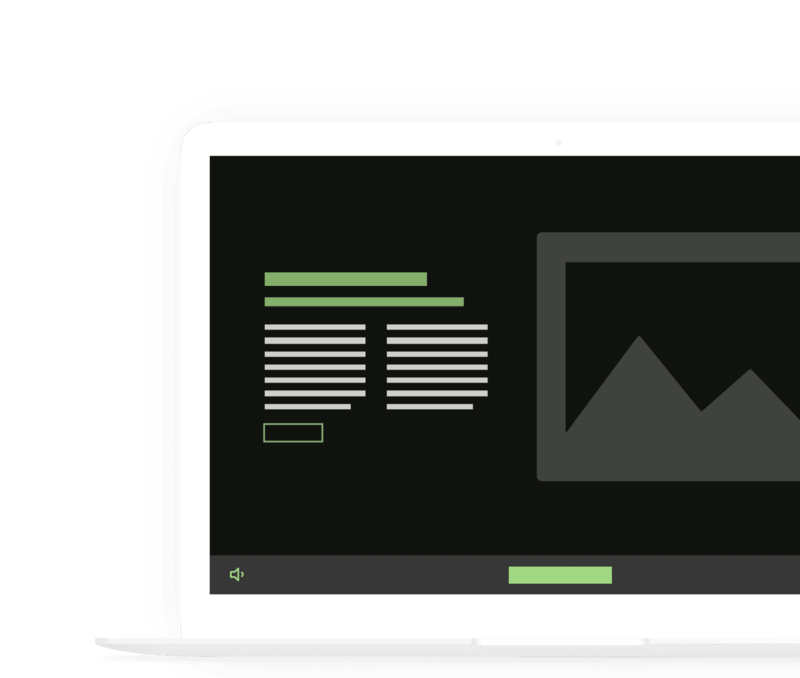 In order to keep the website design simple, uncluttered, and easy to use on mobile devices, emphasis was placed on creating a visual elements and minimizing the use of text. This was further enhanced by having the distinctive didjeridu sounds of the exhibition play upon the user scrolling. A one page model was chosen as it tells the story of the exhibition, using full screen content areas to maintain user engagement. This was more effective than creating a new page for each section, where the flow of the story may have been lost. With the utilisation of strong imagery, content and videos, visitors are lead on a journey through each feature section of the exhibition. The story continues with a gallery, a showcase of supporting sponsors, and ends with a ‘call to action’ prompt to purchase tickets from the SA Museum site. 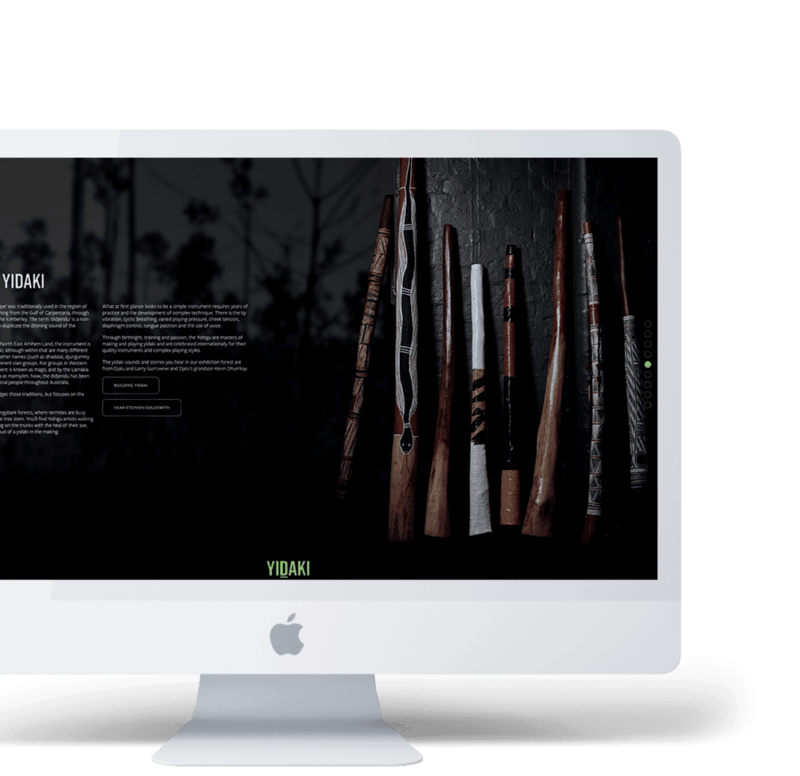 Taking the approach to develop an exhibition specific landing page has enabled the South Australian Museum to generate greater online reach and awareness of the Yidaki exhibition than what would have been achieved through the main SAM website only. In addition to this, the reusable website framework developed for the Yidaki exhibition can be repurposed for future exhibitions, and ensures accessibility on a large variety of devices. Mobile access made up 67% of the users, without any drop in engagement due to the compatibility of the site on mobile platforms. Social media referred 66% of visitors, reflecting the strong presence the Exhibition had with events, commentaries and sponsored posts. Over 1,700 interactions were also captured of users watching the videos on the site, and following through to SA Museum links and Facebook events.